Radiant Barrier went in yesterday morning courtesy of www.energyimprovements.net. We added a foot of insulation as well as the energy shield radiant barrier. The barrier looks like aluminum foil spread over the entire attic but is hard as nails. I tried scratching and tearing a spare piece of it to no avail. The temperature only took 15 minutes to drop two degrees in mid-afternoon, opposed to taking over an hour pre-barrier. We are pleased thus far! In other news, Jeremy’s company softball team, the KPMG Camels, ended their 2 game winning streak last night. 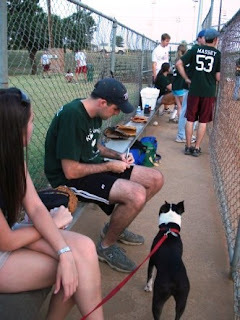 Jeremy is the team statistician and first baseman. Last night he was 2 for 2 with 3 RBIs and 1 run scored. I was unable to obtain his batting average for the season. Patton is the team mascot and has attended every game. We are working on getting camel humps to strap onto his back. The games have been fun. Especially since I get to go home with the handsome first baseman!